Corpus Christi is always an adventure in the making. The feral hog is close, less than a hundred feet away, standing in belly-deep water. Windswept tendrils of gooey gray mud spill from its lower jaw as it shakes its head like a giant wet dog. The animal bites down on something solid, most likely a crawfish, and grunts with satisfaction. Replete with tusks and a pink, rubbery nose that makes wet, whistling sounds as it breathes, the 200-pound boar resembles a hairy mini-hippo. It sniffs the hot morning wind, inhales loudly and then once again lowers its head deep into the water, swishing its snout from right to left as it sifts through the silt. It occurs to me that roseate spoonbills feed the same basic way. The comparison ends there. No mud mask is going to make this beast pretty. The temperature inside the canvas blind is already 85 degrees. Humidity? I might as well be in a sweat lodge. You’ve got to really love this stuff to do it, especially when it’s hot. 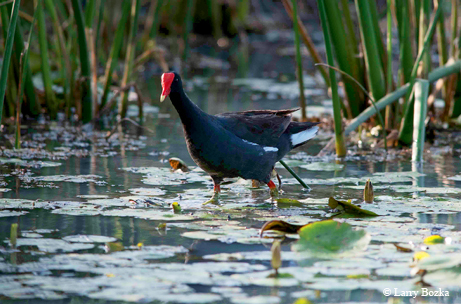 I’m the one, after all, who assured Sally Crofutt, manager of the 4,000-acre Fennessey Ranch in Refugio County, that I would cowboy up to get quality photos of feral hogs and … wait for it … purple gallinules. Yes, purple gallinules. The stocky-bodied ducks might pass for coots if it weren’t for their neon-bright beaks and markings. But they’re the stuff of serious bird watchers’ fancies and are a major attraction here. Right now, though, the hog is … well, hogging the attention. His noisy chow-down attracts company. A second hog of almost the same size and coloration steps out of the lime-green maze of reeds and down into the water. Now this is the way to kick off a three-day adventure. And we’re not even in Corpus Christi yet. The tiny burg of Bayside is the nearest town to us at the moment. The focusing ring of the 400mm telephoto accommodates the boar’s approach, and I get a crisp view of its menacing, amber-red eyes. By now, I could poke it with a cane pole. The Fennessey Ranch is a land of contrasts. Part of a 171-year-old family legacy, the desert-like but stubbornly lush spread is intensely managed for both wildlife and wildlife photographers. Photo blinds are positioned relative to the sun for optimal exposures and modest shooting distances. Spring water cascades through scenic and rocky habitats. Three of the blinds are large, basement-like pits with wood-slatted walls and viewing slots that provide spectacular ground-level shooting angles. The hogs eat their fill. With breakfast finished, their interest disappears. Soon, so do they. Despite their size, they become completely undetectable with only a few steps inside the thick vegetation surrounding the sprawling and shallow lake. A pair of common moorhens scurry out of the reeds. The birds, also known as common gallinules, hopscotch across the lily pads and punctuate the air with scratchy, abbreviated chirps better suited to chickadees than waterfowl. A red-winged blackbird stops to rest on a nearby stalk. Ivory-feathered wood storks flutter and land in a puddle-thin patch of water. Great blue herons, snowy egrets, mottled ducks and several species of songbirds complete the gallery. My photographer friend Mark Hall is scouting caracaras — sharp-beaked “Mexican eagles” — from a pit blind more than a mile away. They are the ranch’s signature bird species. Crofutt and ranch owner Brien O’Connor Dunn have collaborated to make the Fennessey Ranch one of the nation’s best and most reasonably priced wildlife photography venues. They’ve also helped produce stunning coffee table books that document friendly photo competitions between area ranches. The Fennessey also accommodates hog hunters and, on occasion, stargazers and amateur naturalists. Visitors usually ride in Swedish-made Pinzgauer 4x4 trucks. I can now add the common gallinule to my photo library. The purple variety evaded me. Still, they’re just one of countless creatures that we’ve yet to see here. They and their elusive nature are at the heart of what make the Fennessey Ranch a bona fide Texas treasure. With a return already in mind, we bid our farewells and head south through Corpus, all the way to Flour Bluff and the foot of the JFK Causeway. Laguna Shores Road quickly leads us to one of the 24 spacious and well-appointed rooms at Bluff’s Landing Marina & Lodge. 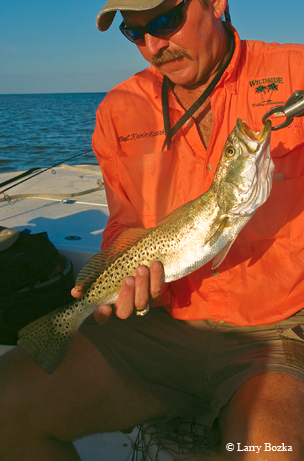 Most anyone who fishes for Baffin Bay’s famously large speckled trout or sight-casts the grassy coves of the legendary Nine-Mile Hole for bottom-grubbing redfish knows about Bluff’s Landing. Whether it’s for a one-hour run to drift-fish Baffin hot spots or a 15-minute boat ride to wade the King Ranch shoreline, Bluff’s Landing is a principal launch pad for serious local anglers. Capt. Kevin Sparks is one of them. Sparks, 46, grew up fishing the Coastal Bend and has been a guide for more than 18 years. The personable pro follows redfish, trout, black drum and other species with year-round accuracy that can come only from repeat experience. Sparks’ 21-foot Shearwater is berthed in one of the marina’s roughly 100 covered boat slips, saddled atop a pair of stout, hydraulic-powered lift straps. In the time it takes Hall and me to walk from our room, Sparks has the ebony-hulled flats rig afloat, its massive 250-horsepower engine quietly idling. The sun is barely pinking the horizon as Sparks follows the clearly marked channel out of the marina. We move past the cleaning table that, come lunchtime, will be the center of activity, beyond the adjacent restaurant and on toward the bridge. Several miles beyond the causeway, a sand-dappled flat spills lavishly to the east. Sparks cuts the ignition and quietly slides the anchor overboard. Small, oily “slicks” begin to pop up on both sides of the boat. Only two things cause that phenomenon: feeding fish, usually speckled trout, and freshly baited crab traps. There’s not a crab trap in sight. It takes a few casts of small live croaker to begin drawing attention. When the bite begins, it begins in earnest. The fish are respectable, chunky-bodied specks, all between 17 and 22 inches. Hall and I keep a few to eat fresh and release the rest. Of all the great things about fishing here, sheer quantities of fish aside, perhaps the best is that any cast at any time of year can result in a 10-pound-class speckled trout. Sure enough, when we return to Bluff’s Landing there are two such specimens being shown off at the dock. Roger Viar is production-line busy, filleting and bagging fish at the cleaning table. His wife, Annette, is inside helping customers with everything from terminal tackle to maps to baitfish to fishing advice. I take an informal survey and confirm that, as suspected, almost everyone here is a repeat customer. The regulars happily mingle, eagerly swapping tips on productive lures and promising locations. It’s often said that fishing is as much about camaraderie as anything. Bluff’s Landing is proof positive of that. We celebrate the day with dinner at Laguna Reef Restaurant, the dining establishment we passed this morning. The place is a veritable shrine to saltwater sport fishing. The walls are festooned with time-yellowed photos, newspaper clippings and aging mounts, all telling the tale of the area’s incredible angling. Business cards and even more clippings are sealed inside the deeply varnished surfaces of the restaurant’s wooden tables. It’s a museum of sorts, a uniquely spellbinding display of Corpus Christi’s tradition-steeped culture and history. Calamari appetizers, grilled mahi-mahi entrees and a Laguna Madre sunset collectively create the ultimate seafood combo. Perhaps better yet — two tables away, three sunburned fishermen are enjoying the freshly cooked fillets of the same trout and redfish they caught early this morning, a Laguna Reef specialty. A good night’s sleep, and day three comes quickly. I haven’t been to the Texas State Aquarium since the mid-1980s. It was impressive then. Now it’s almost unbelievable. No one could absorb this entire place in a single day. No way. Aquarium staffer Kristin Ralls meets us and leads us on a tour, a brisk, kaleidoscopic mix of both common and exotic marine species and excited visitors in khaki shorts and Hawaiian shirts. All are busy interacting with something or someone. If I were a toddler I’d say I was at risk of overstimulation, an observation I share with Hall. He chuckles, and then is immediately distracted by a huge black-and-white grouper hovering motionless in a nearby aquarium. We walk past Stingray Flats, where mesmerized children gaze at, and even touch, debarbed stingrays. Islands of Steel, a re-creation of an offshore production platform, bustles with snapper, spadefish, grouper and even tarpon. The Flower Garden exhibit mimics both the habitat and the inhabitants of the famous and faraway Gulf of Mexico coral reef, all the way down to the moray eels. A crowd gathers around Tortuga Cay as a diver hand-feeds one of the multilevel lagoon’s rehabilitated sea turtles, a hungry Kemp’s ridley. The Texas State Aquarium is not only a pristine home to countless fish, reptiles and birds, it’s also a critical wildlife rehabilitation facility, a dynamic and burgeoning youth education centerpiece and a vital part of the Texas saltwater hatchery system. It’s staffed by what may well be the friendliest, most knowledgeable gathering of marine biologists, animal rehabilitators and communicators on the planet. If there’s one thing I regret, it’s that we don’t have time for the Deckside Dolphin Encounter. Like the turtle habitat, Dolphin Bay facilitates viewing from both above and below. It’s the 400,000-gallon home of three male Atlantic bottlenose dolphins — Shadow, DJ and Kai. The habitat is immaculate, its waters crystalline and its inhabitants vibrant and energetic. I’ve already met Kai, an especially outgoing fellow, but only from a distance. Next time — and there will be a next time — we’re going to get hand-shaking close. I might even pay another visit to that big feral hog. He was pretty awesome. I’d even think about shaking his hand. But there’s no way in the world I’m ready to let him kiss me.